The North Korean communist regime recently tested a nuclear weapon, fired a ballistic missile over Japan, and has made brazen threats against the United States and its allies. In response, the Trump administration is negotiating sanctions with key players in the region, including China, which may forbid everything from luxury items to oil from entering or leaving North Korea. The growing tensions, and North Korean leader Kim Jong Un’s apparent unwillingness to end his threats, have likewise stirred concerns of a possible war with the regime that could draw in the United States and its allies, South Korea and Japan. War with North Korea is still unlikely, however, according to Richard Fisher, a senior fellow with the International Assessment and Strategy Center. “The chances of all-out war are modest to small, not medium to large,” Fisher said. However, the United States may need to take a more proactive stance in military defense, he says. Fisher noted that this desire for self-preservation and the preservation of the North Korean regime is the reason why the Kim family has pushed for the development of nuclear weapons. The communist dictatorship uses the fear of nuclear war to subdue foreign intervention in its brutal regime, and it leverages the international responses to its actions as propaganda to convince its people that the outside world wants to destroy it. With this in mind, Kim is going to continue to develop nuclear weapons, continue to broadcast his tests, and continue his efforts to force the world to the negotiating table—as the regime has been doing for decades. In 1967, the Chinese Communist Party tested its first hydrogen bomb, detonating it in the atmosphere, which generated an image that shocked and awed surrounding countries. Fisher said, “The North Koreans would of course remember this,” and North Korea may want to eventually repeat the spectacle. “But I don’t put a high probability on Kim waking up one morning and deciding to end some American city, and in consequence, end his own country,” Fisher said. In the current situation, however, the United States does have a dilemma. 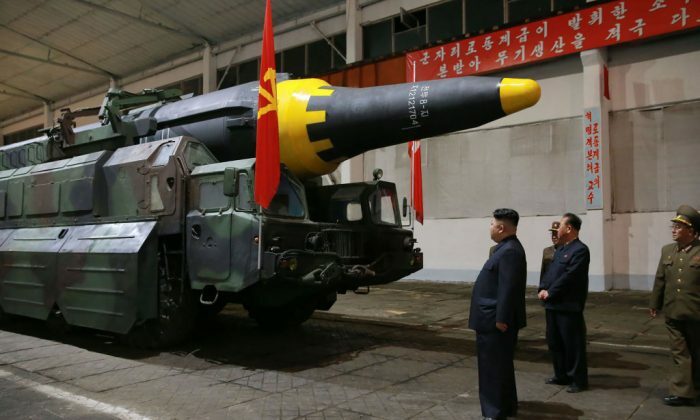 North Korea’s recent nuclear weapons test showed it likely has a 100-kiloton warhead, about five times as powerful as those used by the United States on Japan at the end of World War II. The United States is currently looking at all options—military and otherwise—to deal with North Korea’s rising threats. Fisher’s suggestion is that the United States should renew its deployment of nuclear weapons in East Asia, a policy that was ended by President George H.W. Bush in 1992 in a failed attempt to convince North Korea to also withdraw its weapons. As the military environment in the Asia-Pacific region has become more tense, Fisher noted the political opinions of leaders in South Korea and Japan have likewise been changing their stances on military power. He noted that in South Korea, there is growing support for the United States to again deploy tactical nuclear weapons in the region—a move that previously only South Korea’s conservative opposition parties had supported. The phrase is, of course, deeply hypocritical. The Chinese regime maintains nuclear stockpiles, and it has aided North Korea in the development of its nuclear weapons, despite sanctions. The slogan is directed not at North Korea but instead at the United States. On a deeper level, however, Fisher said the conflict shows an ongoing problem that the U.S. defense posture has been reactive, rather than proactive.